The largest concentrations of warblers, those colorful migrants from the tropics, occur the first three weeks in May with some lingering into early June. They, along with their not so colorful relatives the thrushes, vireos and flycatchers stop to rest and feed in our woodlands on their way north. A few species of warblers will nest here including northern parula, yellow-throated, Louisiana waterthrush, American redstart, ovenbird, prothonotary and Kentucky warblers. Other summer residents from the tropics, the tanagers, grosbeaks, orioles, wood thrush and great crested flycatcher arrive in early to mid-May. Migrant shorebirds visit our wetlands as well as flooded fields in wet years and mudflats along receding lake margins in dry ones. Platte River sandbars are host to two endangered species, summer residents that arrive from early (piping plover) to mid-May (least tern). 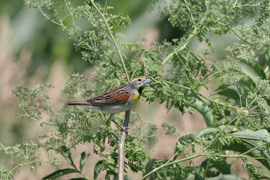 Prairies and grasslands host summer residents including dickcissels and grasshopper sparrows that arrive in early May.